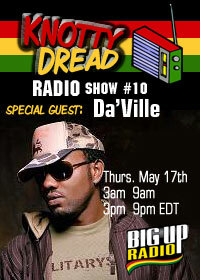 The Big Bad Singer "Da’Ville," aka Orville Thomas, the lead singer of the once renowned reggae dancehall boys group ARP (A Raw Perspective) is taken his solo career to new heights. It all began at the age of 16; Da’Ville wrote and recorded his first single under the influence of his father. "I voiced the first song for him, my first real recording". Prior to that, the Jamaican born native had been using his natural talent singing at the St. Peter’s Clever Church choir and performing at local school functions. Da’Ville enjoyed singing so much that he knew from an early age that music would be at the forefront of his career goals. "I once thought that I would become an accountant or a manager for a large corporation, but music influenced me so much that I felt a sense of satisfaction using it as a medium to express my life experiences. In the end, my music became my greatest influence, passion and joy."